For the Active Students applying at the educational programs Pre-Academy (18y), Bachelor & Master Artist (18+ and post graduates, no age limit), the educational program consists of 14 lessons of one hour each during the academic year from September to July. 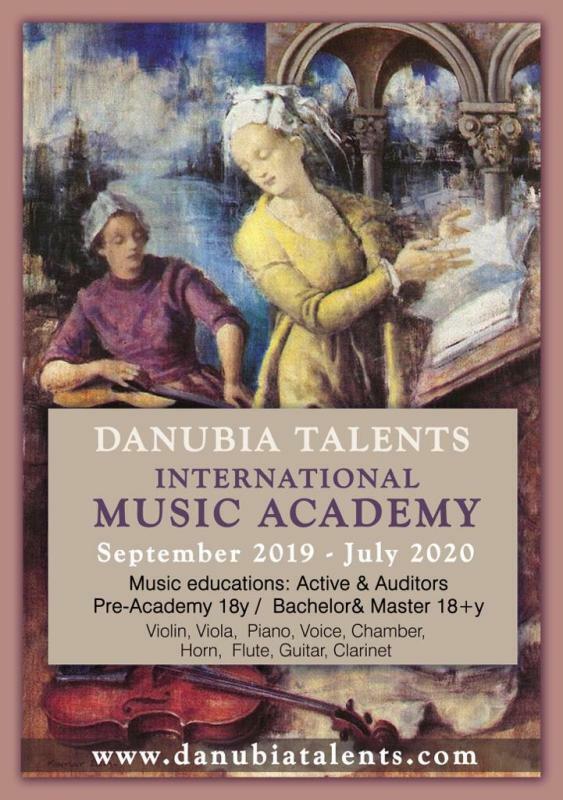 Students who – according to the evaluation of the respective instructor/s and of the Artistic Director of the Danubia Talents International Music Academy - excel particularly, will have the possibility of any concerts. No particular qualifications are necessary for registration; only the application form is required, together with payment of the auditor’s fee. All Active students who have attended lessons regularly will be granted attendance certificates. Diplomas of Merit or Honor will get. All fees must be paid in the exact amount requested. This fee is to be paid in its entirety and cannot be refunded if the candidate stops attendance on his own initiative. In case the educational program with the chosen professor, during the academic year has been canceled because of force majeure, the students will have to chose another professor in order to continue and finish the educational program until the end of the academic year. The place and the time of education will be determinate by the choosed Professor. Education places are Italy, Hungary, Austria, Portugal, China, Japan, Switzerland. Accompanist fee is 20 euros. This fee permits auditing of lessons. However, it cannot be refunded in case the student interrupts attendance on his own initiative. The registration fee has to be payed before the 31st of August and the students need to upload to the website the proof of payment together with the application form. The participation fee must be payed after have being accepted to the chosen course.